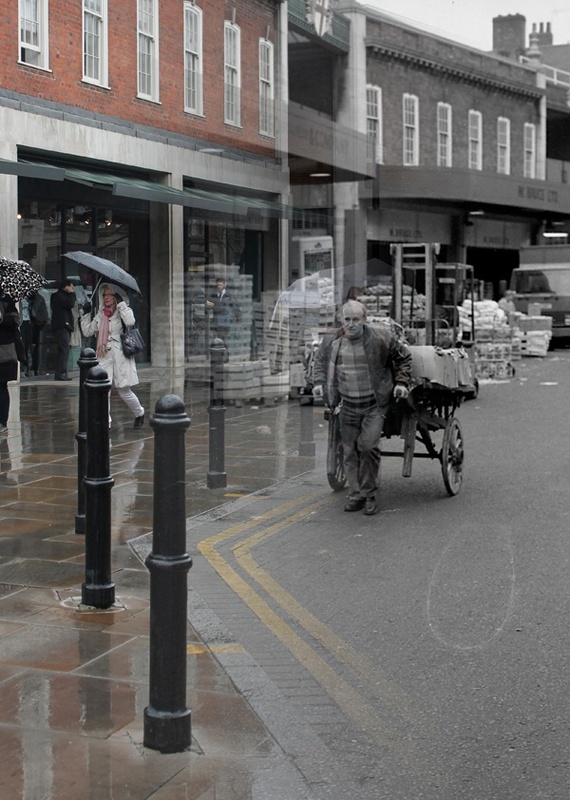 Julian Dobson, author of How to Save Our Town Centres, newly published by Policy Press, explores the cultural and political significance of markets – accompanied with montages by Adam Tuck using photographs by Mark Jackson & Huw Davies. 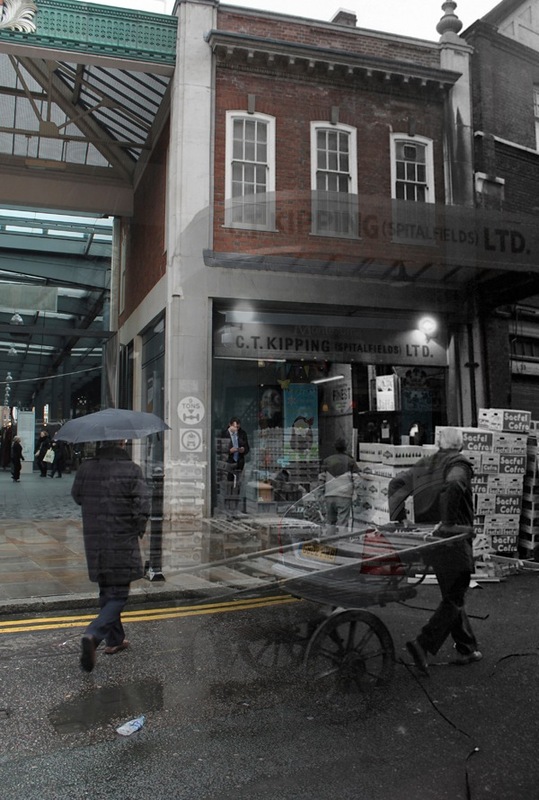 Spitalfields Market had its origins in congestion, stench and foul language. These were the vices that prompted the removal of the market once held within the precincts of St Paul’s Cathedral first, in 1666, to Mansion House and a couple of decades later to the edge of the East End. It is a far cry from a place that today prides itself on catering to the tastes of the hip and the well-heeled. But then markets have always been places of tension and contention. Who gets to use them, who gets excluded and what prices are paid have been the stuff of squabbles through the ages. Sometimes those arguments erupt into violence. One of the most celebrated market riots took place at Nottingham’s famous Goose Fair in 1766, when – according to the chronicler Thomas Bailey – market-goers became ‘excessively exasperated’ at the exorbitant prices being charged for cheese. 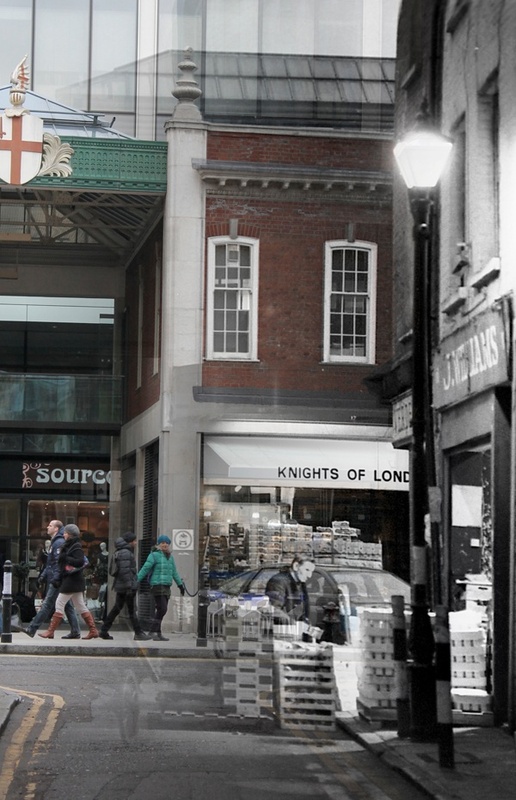 Spitalfields’ own riots happened just a few years earlier, in 1763. They were the result of longstanding grievances over the pay and conditions of silk weavers. In a protest that foreshadowed the Luddite disturbances sixty years later, disgruntled weavers destroyed looms and silk. For good measure, they paraded an effigy of one of their employers around the streets before hanging and burning it. Few use the phrase ‘moral economy’ these days, but that sense of fairness underlies many of today’s tensions around markets and their surroundings. 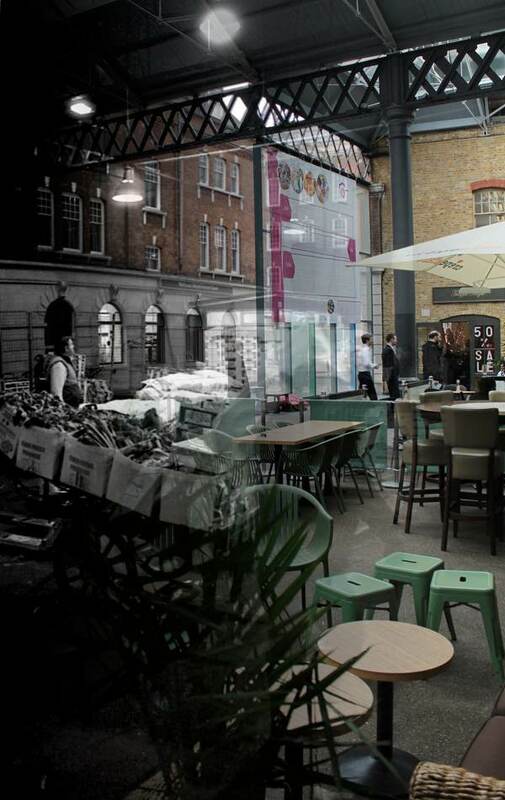 The redevelopment of Spitalfields Market ten years ago was strongly resisted by many local people – the fine line between regeneration and gentrification is often only noticed once it has been irretrievably crossed. In a city where property speculation has become feverish and local councils are under pressure to sell social housing estates for redevelopment, all the signs are that the social contract is once again under unbearable strain. Markets have often been the flashpoints where the tensions inherent in urban life explode. From Queen’s Market in Upton Park in the east to Brixton Market in South London and Portobello Road in the west, redevelopment plans and rising rents have prompted protest and opposition. These tensions matter because they concern not only the historic character of the city’s markets but also the extent to which London can still be said to be a city for everyone. In the nineteenth century social cleansing was justified on grounds of morality – London’s Bartholomew Fair, a byword for licentiousness, was closed by the City of London in 1855. Today the removal of the cheap and unsightly has an economic rationale as markets are turned into ‘destinations’ for wide-walleted visitors. At Queen’s Market, Upton Park, traders and local residents fought a long battle ten years ago to stop the redevelopment of the market with an Asda store, new shops and a residential tower – ironically, on the same site as the once notorious James Sinclair Point, a hulking slab that loomed over the market until 1993. Newham Council, in the PR-speak beloved of aspirational local authorities, claimed the plans would ‘enhance Green Street’s status as a visitor destination’. The Friends of Queen’s Market, who gathered more than 12,000 signatures opposing the plans, believed local residents and businesses would be priced out. The experience of Brixton Village would suggest that those fears were well-founded. Back in 2009 Granville Arcade, six avenues of thirties stalls and shops in the indoor market, was earmarked for demolition and redevelopment. Those plans were abandoned after vociferous local protests – and Space Makers, a collective of artists and activists, set to work to breathe life into vacant market stalls. Space Makers were almost too successful for their own good. A year later the market was thriving, with new food stalls and what the New York Times described as ‘playful pop-up shops’. The market’s owners, London & Associated Properties, saw an opportunity and bills for rent increases started landing on doormats. Some traders received bills backdated to 2007, the date when London & Associated took over, totalling tens of thousands of pounds. Five years on, Brixton is now the scene of protests against gentrification (symbolised to many by the appearance of gung-ho estate agents Foxtons) but the new demographic of latte-drinkers and cupcake-consumers has become entrenched. 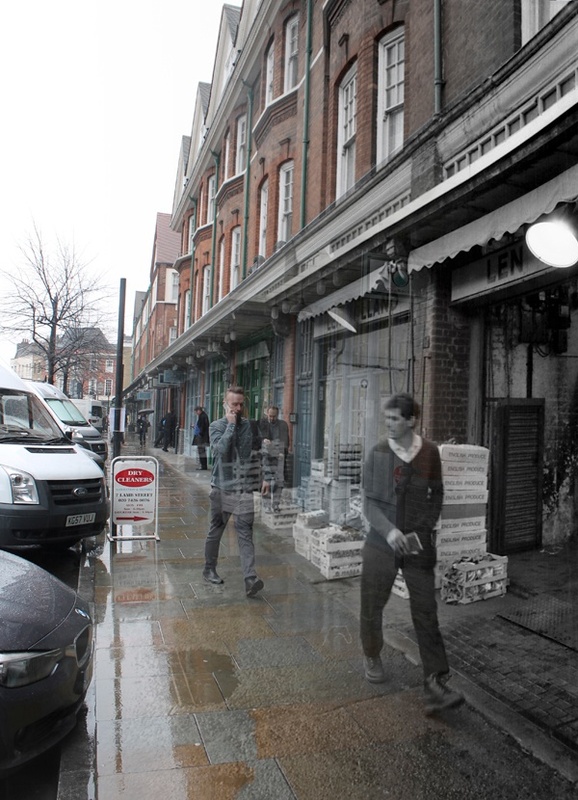 For better or worse, Brixton’s character has changed. Over in West London similar tensions are evident at Portobello Road, home of Britain’s largest antique market. Recent proposals to move some of the market stalls into a new purpose-designed centre by the Westway flyover have prompted opposition from local residents who claim it will replace a much-loved outdoor market with a ‘sanitised shopping experience’. The irony of Portobello Road is that the plans have been put forward by Westway Trust, a charitable trust set up to protect residents’ interests after the hugely disruptive construction of the A40 flyover in the sixties. The Trust was gifted the land below the flyover – space at the time thought to be of little commercial value – and has since developed much of it with business premises and community facilities. Now the Trust itself is being accused of the kind of behaviour usually associated with the capital’s more cut-throat property developers. These are local difficulties, but they are also part of a much wider continuing tussle over who gets to use the city and its public spaces, and on what terms. The attributes valued by many – accessibility, value for money, inclusion – are seen by others as the problems of congestion, stench and foul language. There is not much stench to be found in Spitalfields Market today. Writing in the New Scientist in 2014, Sheffield University academic Victoria Henshaw described a ‘smellwalk’ through the market. Whereas in Istanbul she had found ‘perfumes and body odour, leather, spices, Turkish delight’, in Spitalfields ‘I smell nothing until I reach the far end of the market where I detect some faint ventilation emissions from a restaurant’. Sanitised, smell-free environments are not markets – they are shopping malls, and there is little room in them for the ‘moral economy of the poor’. London removes its congestion, stench and foul language at its peril. I love the way the pictures morph together, very cleverly done.. I wish I could step back into the ‘old’ bit though..! Excellent article. Very thought provoking. Thanks very much. The theme of this message is particularly relevant to me as a market trader in Sclater Street (Club Row) as many people will know the relatively recent completion of the Avant Gaurd tower that now occupies half the length of Sclater St has SIGNIFICANTLY changed the atmosphere of the area and is seen by many as the begining of the ‘stripping out’ process to rid the area of any remaining character which of course would also include (I believe) the traditional street markets, which are usually regarded by the ‘money men’ as standard bearers of privateers and individualism that are so vehemently despised by corporate property developers, as a long standing trader in this market I often find myself being unwittingly sited as spokesman for many of the stallholders and as word spreads this has also not gone unnoticed by some people in the new development which has unfortunatly had the knock on effect of making me the focal point of a number of vocal and in one instance even physical confrontation with residents of the new developmen, many of whom ironically now seem to regard the market as a ‘blight’ on THEIR lives, (totally disregarding the fact that THEY are the NEWCOMERS) and now with yet another substantial development already well underway nearby (which itself caused the loss of a large part of the market ) I can only see the opposition to people like me intensifying as the surrounding developments begin to close in, to me as someone often regarded in many ways as being at the bottom of the social ladder, it says everything I need to know about the mentality of faceless corporate developers with unimaginable wealth at their disposal that they can look at someone like ME, standing in the street with a board and trestles trying to earn a modest but HONEST living and feel NOTHING but DESPISED RESENTMENT towards me. PS, to ROS, thank you very much for your kind words on Sundays post, I was VERY humbled by your comment. These are amazing and make me quite sad that the area has changed so dramatically. 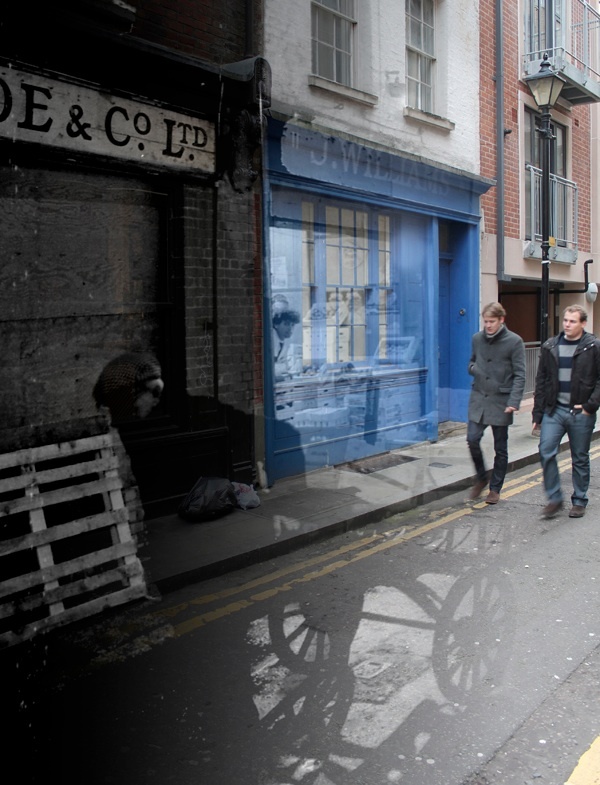 It would be wonderful if like the photos, the two Spitalfields could exist side by side. I remember when my mother in law worked in the crypt, as cook housekeeper, the bonfires at the bottom of Brushfield Street with people hoarded round them just like in one of the photos. I wish I’d taken photos then but didn’t realise than what a significant area it was and how much it would change. My sympathies to the previous commenter – one imagines the new residents chose to live there because it was a bit “edgy”, perhaps a tad “lairy”…and now that is just rather grubby. Ordinary people just won’t get out of the streets, will they? Walking about, talking, selling and not being interested in chai latte. I think this has always been an argument in London as populations wax and wane, move out and move in. Brixton was originally a village, was developed as a Victorian suburb for the white middle classes and then became a hot-spot when immigrants arrived. Now the descendants despise the middle classes again. I hope London can find a way to accommodate everybody, cheek by jowl and hugger-mugger as it must be. The sanitising of London is doomed to failure; long live the grubby, the slightly shabby, the cheap and cheerful. It was one of those shops in Whitechapel that sold me an invaluable rain poncho in a downpour, a stall in Petticoat Lane that provided emergency shoes. 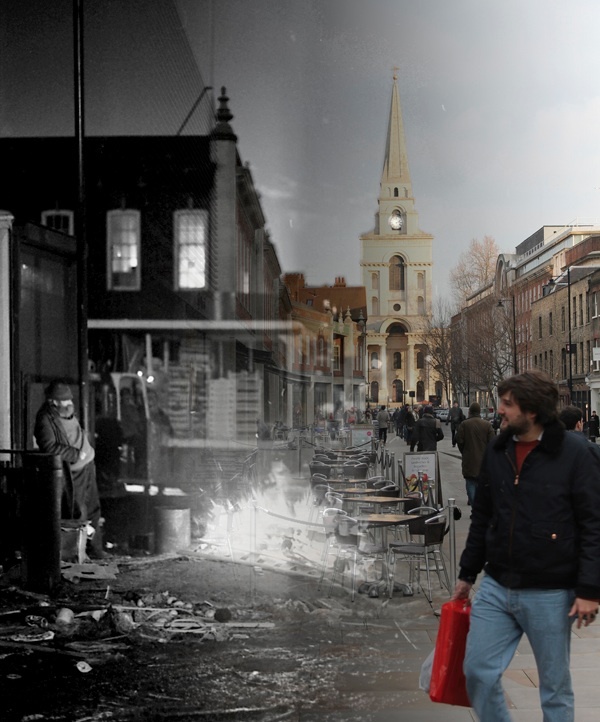 It would have been a cultural disaster if Spitalfields had been allowed to decay forty years ago and I hope it won’t be another if the wealthy force everyone else out. Not in the spirit of London. Certainly not the spirit of Spitalfields. Thanks for highlighting some of the aspects of my intense dislike of the ‘new’ Spitalfields Market. It is mind-numbingly bland, the odourless stalls & stall-holders, who are inconsequential in their palatial surroundings. ‘Sanitised’ is a truly apt description of an irrelevant market, possessing no atmosphere, no ‘vibe’. It literally leaves me cold. Perhaps this was always the intention, so that the developers will ultimately get their way & carpet the area with faceless glass office blocks. Will John Biggs stand-up to any of this? The ideas in this post are powerfully portrayed with these brilliant images. Especially Brushfield St, looking east, with the fire burning. Couldn’t be a greater contrast, past to sanitized present. Please, Zena, don’t stick the boot into us stallholders at Old Spitalfields Market. We’re not all bland. Speaking for myself, I’ve been trading on a Sunday in the old market since 2001, you may have seen me selling vintage eyewear, optical frames and sunglasses, that I restore up the road at home in my workshop. Yes, we’ve been there since before the redevelopment 10 years ago as have many others who are still trading on Sundays: Mark who sells collectible annuals, comics and vinyl; Alison who designs her own silver jewellery; Steve who has a pile of vintage scarves in summer and vintage furry hats in winter, reminiscent of the yards 20 years ago down the Lane; Mo with his cow skin rugs; Freddie with his vintage Harris Tweed jackets; Miles with his hand made giant wooden mirrors; opposite him, Tom with his popular vintage stall for gents; Andy with his quirky glass designs; plus, off the top of my head: Ning, Chris, Diana, Michael, Jenni, Marvin, Dotan, Koby who all design their own clothes and not to mention Louie, an artist who is still here since the Sunday market started in 1992. 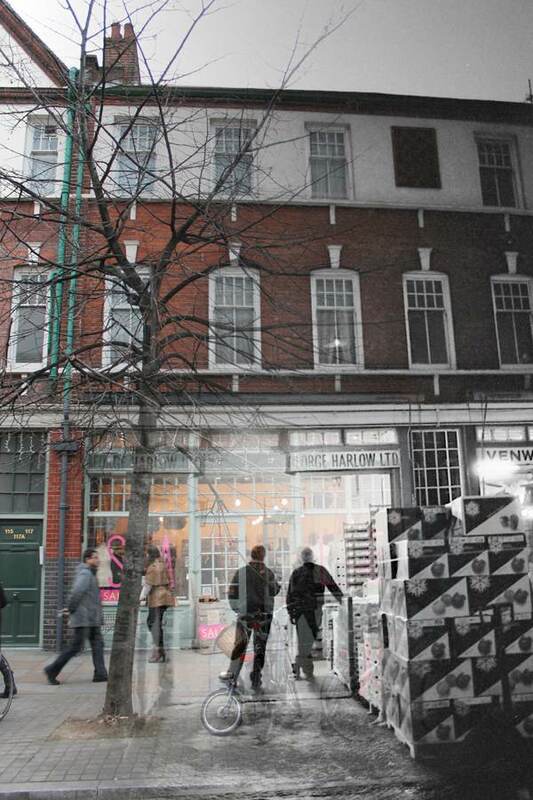 All of us – plus many more that I can’t list here – have been here since before half the market was torn down in 2005 and it says something that through all that we’re still here today, running our boutique businesses from Spitalfields. One could argue that it is us that has created the popularity of the area (I know I do!). So please do not put us down. We’re still here on a Sunday and we still need the support of local people. I’ve heard that a lot of locals don’t come on Sundays because they feel it is “too touristy”, but you are missing out because most of us who still run our eclectic, unique businesses are only there on Sundays, the traditional East End market day. Hopefully, see you soon!